“You can smell dental disease way before you can see it,” said Doc Truli upon meeting Precious, an 8-year-old female spayed Yorkshire Terrier. Precious saw the groomer at least once monthly. She ate only organic food. She drank reverse osmosis water and distilled water. She played at the neighbor’s house every day with her Poodle best friend. In short, Precious was well taken-care-of. She enjoyed her life. Precious never had her teeth brushed. She never had a deep dental cleaning. 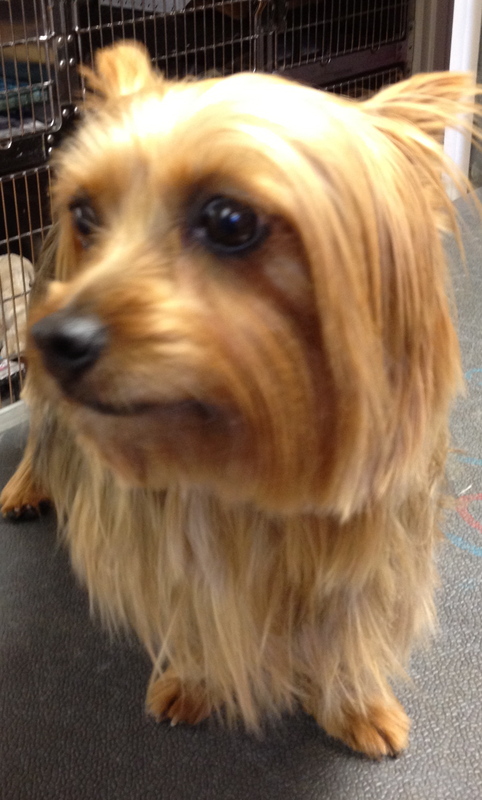 Precious was a Yorkshire Terrier, one of Doc Truli’s Top Ten Dog Breeds Prone to Periodontal Disease. “She doesn’t let me brush her teeth,” said Precious’ mom, Debbie. Of course not, her teeth hurt. “How could this happen?” asked Debbie. “Yorkie’s are prone to periodontal disease. Plaque is a fuzzy biofilm of saliva and bacteria that coats the teeth within about 12 hours after a meal. If it is not removed physically or enzymatically, it starts to attract calcium and form calculus (aka tartar) in 5-7 days.” This process occurs even with organic food and clean water, although food a dog can chew and scrub the teeth with will help keep the teeth cleaner. Once the thick tartar accumulates, a deep dental cleaning under anesthesia is needed to get the plaque and disease out from under the gumlines. 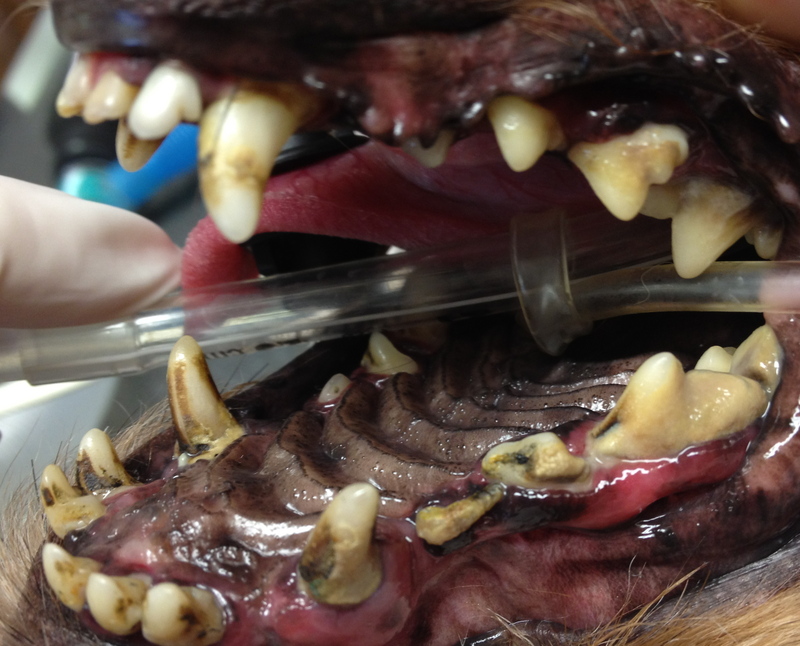 Unfortunately, almost all dogs have extensive periodontal disease before their people even realize they have tartar. Some of this disease is discovered with a thorough physical exam under anesthesia. A dental depth probe checks the gums to see if they have pulled away from the sides of the roots of the teeth. Radiographs (x-rays) check deep into the jawbone. 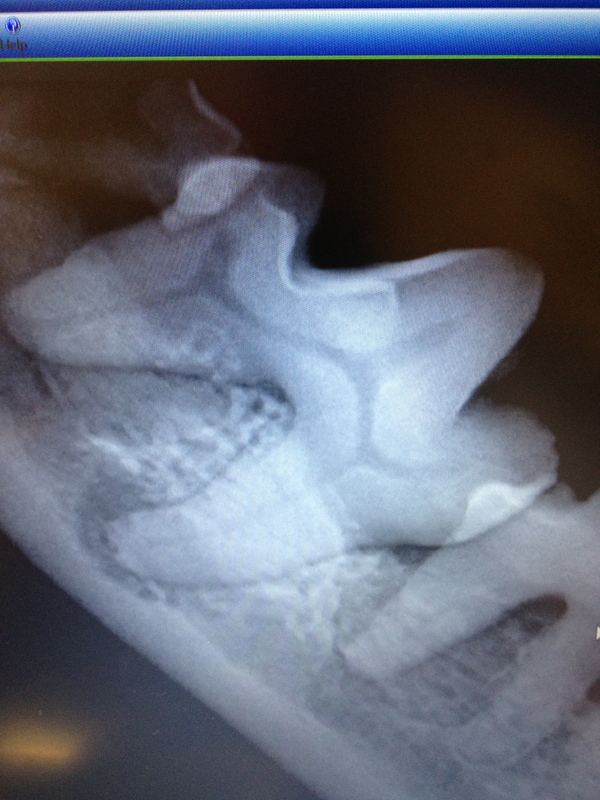 Tooth root abscesses and other surprises sometimes only show on x-rays. “Your veterinarian or veterinary dental specialist cannot tell you how many teeth are diseased until after the exam and x-rays under anesthesia. 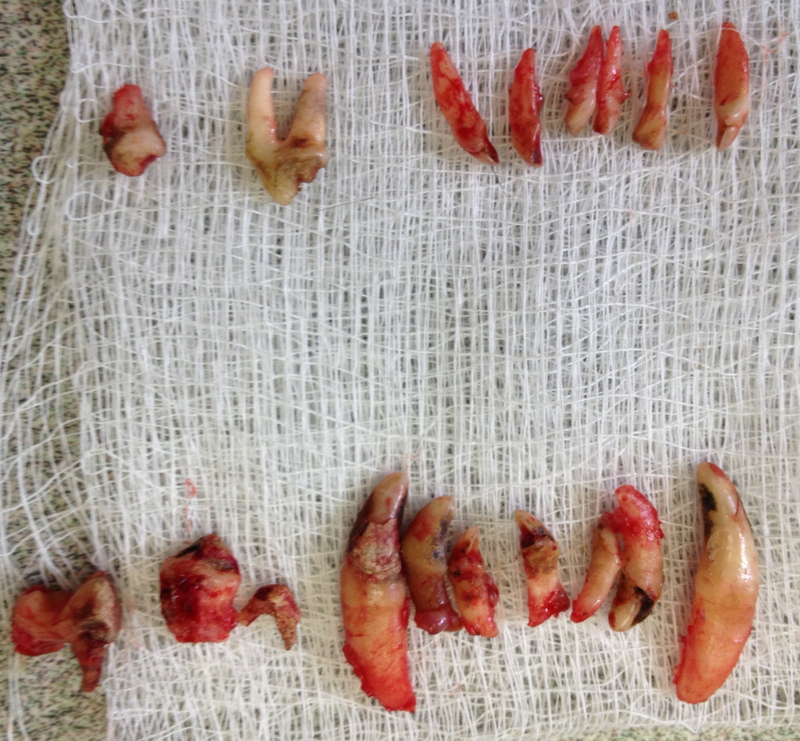 You will be shocked how many teeth Precious needed extracted!” says Doc Truli. Remember to ask your veterinarian if they perform dental x-rays on every pet who is under anesthesia for a dental evaluation and cleaning. Only 10% of vets in America have dental x-rays and not all of them use them every day. Does your vet take dental x-rays? Precious the Yorkie Needed 18 Teeth Removed! Doc Truli evaluated Precious’ teeth. One little two-root premolar actually swung back and forth like a barn door! Doc Truli called Debbie during the procedure to let her know the news. A shocked Yorkie mom asked,”What will she eat with?” (Everyone asks that!) Doc Truli said,”She’ll eat better than she does now!” Imagine trying to eat with 18 loose, infected teeth with red, swollen sore gums! 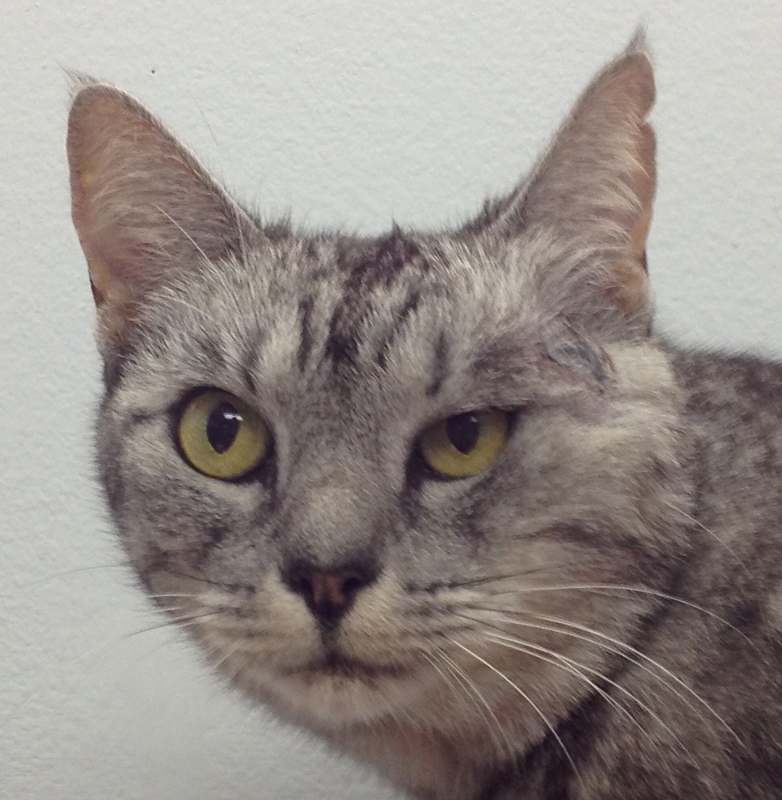 Precious recovered quickly and fully from her surgery and anesthesia. After a few weeks of healing, she started enjoying having her (remaining) teeth brushed. Sometimes she drags a tooth-brush under the sofa and will not bring it back. That’s okay, she needs a new one every 6 months anyway! ← Is It Bad to Let My Pet Pass Away Naturally? 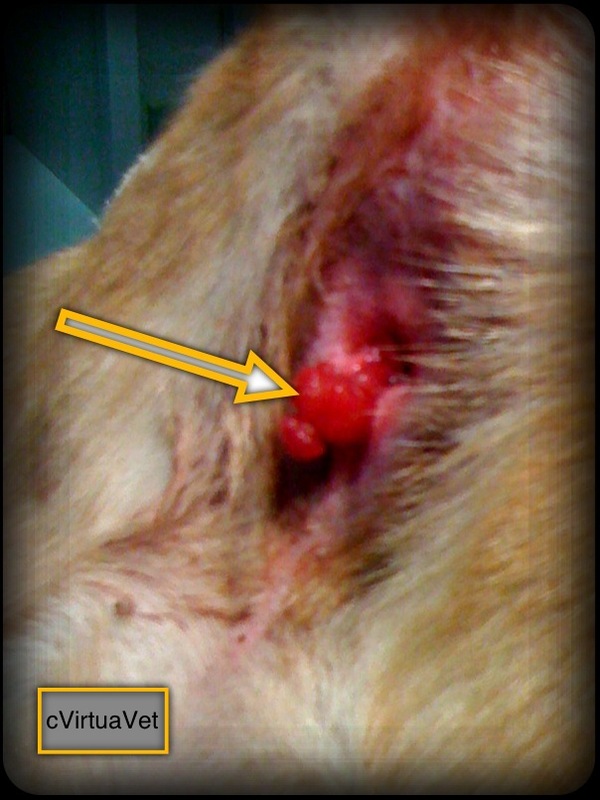 My dog developed a sore eye took him to the vet $350.00 later I was told he has dry eye and given tube of eye ointment. Went home. The next day he kept rubbing his face on the floor and I noticed a wound under the eye. Of course it was a Sunday, so I rushed him to ER for pets. She tells me he developed an abscess in his mouth that he actually burst and it came out on the outside. 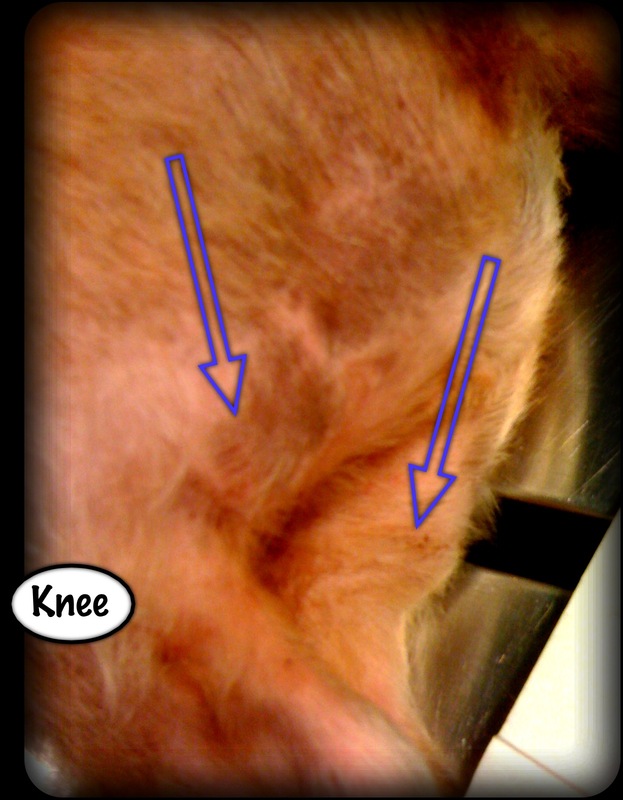 I was shocked that the first Vet did not see this. I told the first vet that he had a very bad breath, and he said well he does need some dental work. I had deep clean last year and a regular teeth clean about a month ago,and he still had bad breath. I felt so bad as he never showed any signs of pain. Well 10 teeth removed $1000.00 later he is doing great. Money well spent, but I feel kind of cheated that the first Vet did not see it especially since his eye was so swollen. 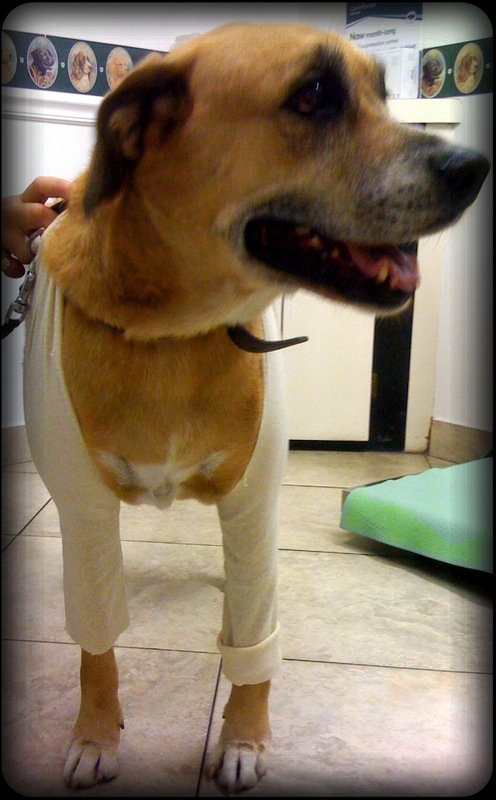 and knowing that my dog was suffering with an abscess. My 8 year old Yorkie, Budster, had 14 teeth removed yesterday 6-29-17. I did not know how important it is to exercise brushing everyday!! He is on 3 medicines, post surgery, and is expected to make a full recovery. Do not give your dogs anything rawhide, the paste that forms sticks to teeth and ruins them! I am fostering an 8 yr old Yorkie who will be scheduled soon for extensive dental surgery. I will be adopting him as soon as he has a clean bill of health. What can I do in meantime with regard to his oral health? That is a great question for your family veterinarian. A general recommendation may not be valid. For instance, if he has loose teeth, it could be painful for you to brush them and cause him to develop an aversion to tooth brushing, which will make it very difficult to keep his teeth clean in the future. So, your question is best put to the veterinarian who knows him. I advise everyone with a toy breed to have their teeth cleaned periodically. My Yorkie had 17 teeth removed. My vet charged $98 plus $10 per tooth extracted, and sent me home with a bottle of antibiotics ($13). I am in Athens, GA. where median income is approx $35,000. It was worth every cent. My dog is 8 years old and is so much more healthier, and active now. He is like a new dog! Thank you for sharing your experience. I remember my first job in Maine in 1999 charged those same prices. You are indeed lucky to have such low prices in your area of Georgia in 2016! I know this post is a little late. But I just ran across it. Could you give me the name of the vet. I live I TN and will drive there for that price. Please i need help with my girlie teeth the are really bad I have no funds to get them pulled the 2 dogs were my daughters she couldn’t take care of them any more bec of bipolar andI love them dont want to surrender them but need help asap. Please hear my desperation. I hear your pain. For everyone else reading this- Evelina’s situation is very, very common in America today. I have many clients with emotional control issues, bipolar, or other diagnosis laid upon them by the AMA-trained doctors. Many people have extra human children and many extra dog and cat children dropped at their house or left by stressed, over-whelmed family members or neighbors who move away. Like Evelina, these cash-strapped, stressed out souls are the best people trying to provide for pets and children they did not choose and will not abandon. It is an irreconcilable position to find oneself in. I do my best to be understanding and compassionate. I also place limits on what I will promise and take on myself. It is painful for me to say no or to limit services to good, well-meaning people and causes much stress. my 8 1/2 year old schnauzer has degenerative valve disease ( DVD ) and takes benazepril. we had her teeth clened and all her back teeth were loose had to remove them. 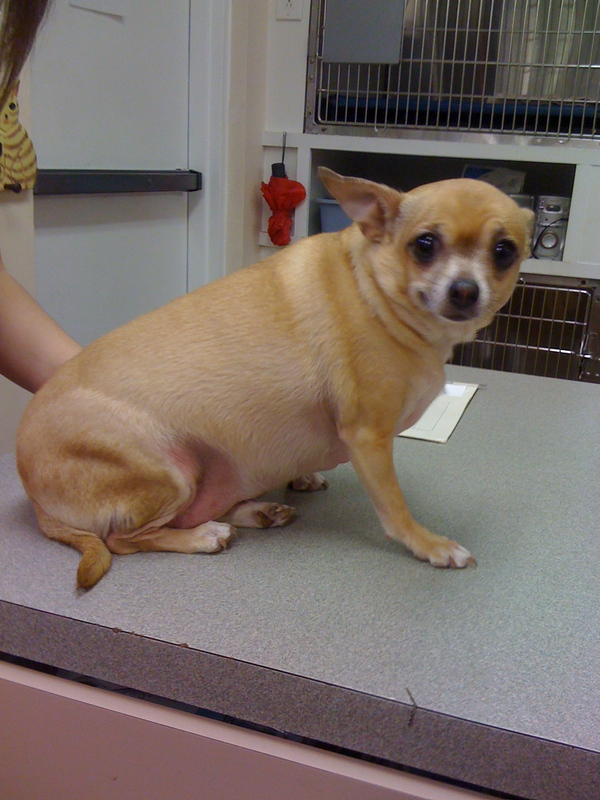 a vet will use special med’s to put a fur baby with hearth disease under to clean their teeth. we do not know what caused her teeth to get loose but had to come out. with heart disease it is so important to keep the teeth clean but a specialist will take very good care of these special babies.they also give clindamycin before and after cleanings so no infection from cleanings get into the bloodstream to the hearth. also their is something called cardo strength by vetri science which the vet told me about along with her benazepril daily I give helps with heart disease in dogs and cats.but only if a vet okay’s it I would never give my baby anything her specialist did not say to or okayed. but the cost of a echo which will tell you everything going on with your babies heart worth the cost around 200.00 up depends the area you live in and my babies dental cleaning and back teeth removal was 350.00 but done by a specialist with 20% off. no charge for removals. and a regular vet would not be same cost. but with her heart I want a specialist to her work with special meds to put her under with her heart doctor there.the dvd heart disease with the schnauzer breed is common. my little one is a toy mini and that didn’t help never go for a breed that the breed the size down. but I love my baby with all my heart she is my child .breeding the size down my schnauzer is a mere 2 1/2 lb little one. my heart is broken and I enjoy each and every day I have with my baby girl. I hope the info will help those with babies w/ heart disease it’s a must to keep the teeth clean or if they get loose even if white have to come out its so bad for that infection to stay in their mouth.wishing the best of luck for all your fur kids. you can find asst to help pay for dental work ask your vet if they have that in your area. nothing wrong in asking as so many of people have it hard these day’s and we love our fur babies. hope this helps. I am a Dental Hygienist and find the radiograph of the abscessed molar very interesting. It looks like the roots are very close to a mandibular canal. I know in humans this canal contains the large IA nerve. In a human we would refer this extraction to a specialist due to the risk of injuring the nerve and causing permanent numbness. Is this a concern in dogs? It can be a concern. The angles on the rads of dog teeth are highly open to interpretation because their faces are all different shapes. So we cannot always tell how close that nerve might be. I have an 17 year old little Yorkie, Jordan, whom I adore. I was advised for the last several years by my former vet (I moved- vet was great) not to put him under anesthesia due to a minor heart murmer that was diagnosed. He has taken Enalapril daily since the diagnosis. My new vet in Atlanta has urged me to proceed with a dental cleaning. she said she doesn’t hear a murmer any longer and he is in otherwise good health (aside from hearing and vision challenges- which is understandable at this age). In recent months I have started hand feeding him canned (Royal Canin) dog food as hard food became difficult for him to eat. Prior to the heart condtion diagnosis I did have his teeth professionally cleaned. I do believe his teeth/gums are compromising his level of comfort and ultimate quality of life. that said, I am terrified of moving forward with the dental cleaning and costing him his sweet little life. there is no denying there is tooth decay/tartar/calcification/bad breath/and some evident discomfort at this point. I am extremely concerned and terrified of making a poor decision as it pertains to Jordan’s life and happiness. I know 17 years is a blessing, but I think he has a few more good years in him and don’t want to rob him (or myself) of that. I would appreciate any professional guidance/advice you can offer. Have a cardiologist for dogs perform an echocardiogram. If the cardiologist clears him for anesthesia, you can feel much better about a decision to have his teeth cares for under anesthesia. Dr. Truli- thank you for the reply and advice. I sincerely appreciate it. How much did it cost for this yorkie to have 18 teeth surgically removed? I have an 8 year old as well in the same condition and I would love to get hers taken care of asap! I cannot give you a great idea of cost because it varies very much depending upon which city, state, country in which you live. Also, a low price means lower technique and sometimes not even surgical close if the sulci (tooth sockets). Exam is $42-$59. Your area may vary. But the long-term effects have been many, some expected and some surprising, all positive! Great job, Sharon! I perform vital pulpotomy often. It’s especially useful if a dog breaks a tooth and you hear it. If I can catch it within 48 hours, I can often save the tooth with the vital pulpotomy instead of using a root canal or an extraction surgery. I’m so glad you fixed his issues with his mouth. BTW, I also provide lots of pictures for my clients the way the dental specialist does. How else can you really understand anything that was done?